A product that is generally made from fermented and partially cooked soybeans, but is also made from other legumes and grains, such as barley, rice or quinoa. 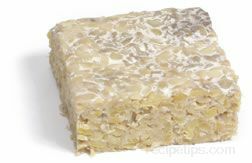 To make tempeh, a process similar to cheesemaking occurs, using the spores of a good mold which are inoculated into the soybeans. As the beans ferment, they become bound into a flattened food cake. The enzymes are then preserved as the product is blanched or frozen. Tempeh becomes soft in texture, similar to soft tofu, and provides a nutty, yeasty flavor when consumed. It can be fried, sautéed, and steamed to be served as a meat substitute and is a popular food for vegetarian and Asian cooking. Tempeh is available at natural food stores and some common food stores.